Germans on Drugs is both a groundbreaking study of the creation of youth drug culture in Hamburg during the 1960s and 1970s and an innovative exploration of the paradoxes of modernization. The very processes that allowed West Germany to flourish after the devastation of the Second World War—consumerism, globalization, and democratization—created the conditions under which a new intractable set of social problems could emerge. Placing Hamburg's drug scene within national and international contexts, Robert P. Stephens examines the ways in which mass consumerism created complicated forms of resistance to state power and cultural norms, and he highlights the fragility of the physical and cultural boundaries of the nation-state in a globalizing world. "Coming in a rush of historical work on the 1960s and 70s, Stephens’s study offers a unique approach. 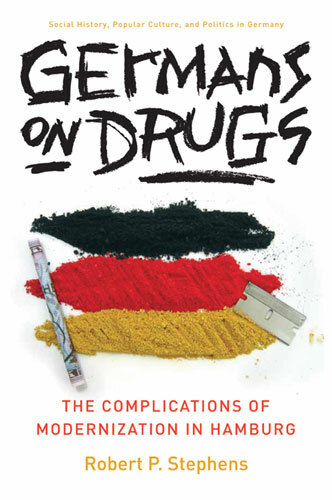 Looking through the lens of drug use and 'the drug problem,' Stephens brings new understanding to a raft of issues concerning not only the Cold War Federal Republic but also modernization, liberalization, globalization, and consumer society, offering important challenges to still-standing complacencies about the period and about West Germany's glide into 'the West.'"